The case has compressed foam composition that makes it very light. Durable weather proof Cordura exterior material, Heavy duty YKK zipper and three digit combination lock, Rucksack straps, two velcro closure bow holders and accessory compartment. 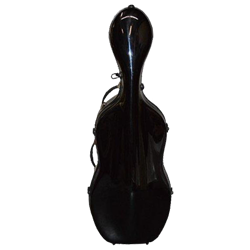 Cello is completely enclosed and end pin does not stick out. Rubber feet on back, side and bottom. It is a durable case for a great price!